Katsu (played by internationally acclaimed actor Koji Yakusho from Shall We Dance and 13 Assassins) plays a 60 year-old lumberjack who lives in a small, tranquil village in the mountains. When a film crew suddenly arrives to shoot a zombie movie, Katsu finds himself unwittingly roped into assisting the production and becomes increasingly frustrated with the pushy crew, especially the young, seemingly spineless director Koichi (Shun Oguri, star of Crows 0, Sukiyaki Western Django and Space Brothers). However, an improbable friendship soon develops between Katsu and Koichi, as Katsu comes to see joy in the filmmaking process, and gradually helps Koichi to recover his sense of self. Soon, their bond inspires an unusual collaboration between the villagers and the film crew. 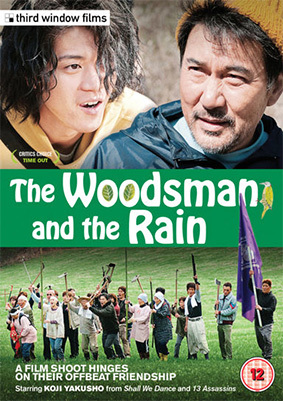 Winner of the Special Jury Prize at the Tokyo International Film Festival, The Woodsman and the Rain (itsutsuki to Ame) is a film that The Japan Times said "glows with a deep love of the movies" and Japan.net claims is a "a movie that'll cheer you up and put a smile on your face for the whole day." It was directed by Shuichi Okita, the man responsible for Chef of the South Polar (Nankyoku ryôrinin). The Woodsman and the Rain will be released on UK Blu-ray and DVD by Third Window Films on 28th January 2013 at the RRP of £19.99 for the Blu-ray. Haven't been able to confirm the DVD price as yet.